minecraft ddos – Welcome to Spinksville! So, Blizzcon was this weekend and as I noted yesterday, there weren’t any huge announcements from Blizzard. 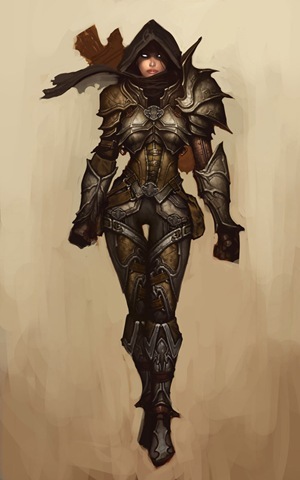 Still, here’s a picture of the last Diablo 3 class, the Demon Hunter. And a link to the (cheesy) trailer. PvP arenas will be available in D3. Apparently during the Diablo Q&A they clarified that they don’t plan for Diablo to be an e-sport, so they aren’t aiming to balance all builds. Cataclysm to be available digitally so you can download it from Blizzard and have it ready to run on release day. Defense of the Ancients style map to be available (free) for SC2, along with other new maps/ minigames. The SC2 DotA is going to use characters from Warcraft and Diablo as well as Starcraft, and sounds like a Big Deal. Relating to DotA, Blizzard chiefs have commented in interviews that they are talking to Valve about rights to use ‘Defense of the Ancients’ and it sounds as though there is some confusion about who owns what. Doubtless the mod designer does own the name, but it’s true that a lot of people would associate it with Blizzard’s wargames. Why was the launch of F2P delayed for LOTRO in Europe? The general manager of Codemasters posted an explanation for the delay in the EU LOTRO forums. As has been widely suspected, it was due to legal/ contractual issues rather than technical ones. We can confirm the launch is imminent and we should be able to announce the dates later this week/early next week. I still resent Turbine for going ahead and launching in the US even though they knew these contractual issues had not been resolved. Will certainly bear that in mind in future. Two big games were released recently but neither has really achieved greatness. Reviewers have not been thrilled and sales back that up. Professor Layton to meet Phoenix Wright! Apparently there is going to be a crossover DS game featuring Professor Layton and Phoenix Wright in a game that is described as a combination of puzzles and crime mystery. That is just too much awesome for one tiny game cartridge to contain! If it doesn’t get released over here there will be … troub^D^D^D^D^D frantic ordering from overseas and heavy use of any friends who happen to speak Japanese. Of course, I’d have to actually finish DQ9 first which doesn’t look to be happening any time soon. I was quite impressed that Reggie Fils-Aime claims to have spent 150 hours playing it too. How stupid exactly do you have to be to think that the best way to encourage an indie game designer to add more content to his game is to take down his server? I’m not sure if the source of the DDOS attack has actually been proved but 4chan was mentioned in the link above, where a post was made claiming that the attack came from impatient fans. I have no words. Tobold had a similar reaction. SOE announced some server merges this week. These are (of course) subscription servers, which are still kept separate from the EQ2X F2P plebs. This isn’t really a surprise because it’s been known for ages that the populations on some of those servers has been getting quite low. Whatever server merges may or may not mean for the game, it’s usually a good move for players on those low pop servers when a merger is done. Player vs Developer comments about what it’s like being on one of the low pop servers that isn’t being merged. In this case, SOE have been reluctant to merge a RP server with a non-RP server, and he’s feeling as though his character has been abandoned.